These were 5th gear pulls. Is it better or more accurate to do the pulls in 4th or5th gear? Here is the Dyno. I think these are decent numbers for what I have. Also I had asked the speedshop not to run it to redline but shift around 6K. So maybe it would have made a little more. I made 378/403 with basically the same setup. I posted a few weeks ago. I'm curious about DYNO's what gear should the DYNO be run at to get the most accurate power rating. I've heard 3rd or 4th gear pulls. My shop did the pull in 5th gear and I thought the car was going to blow up? Closest ratio to 1:1. 3rd or 4th for logging on the street maybe, not on a dyno. Like RSL said, closest to 1:1 in the gearing. Will post an additional dyno when intercooler, downpipes, and possibly inlets are installed for FBO status. Last edited by rsyed07; 05-16-2018 at 02:19 PM. Not too familiar with JB4 but was that on straight pump gas or you have some E85 in there ? This is on race flash with 4g of e85. I haven’t done any walnut blasting so I know there’s a few more ponies we can get out of her. Hahha. Hater! I’m sure one more pull would of been over 400. Map 5 was still auto learning. You should be making more than this. Whats your boost and what LPFP you running? 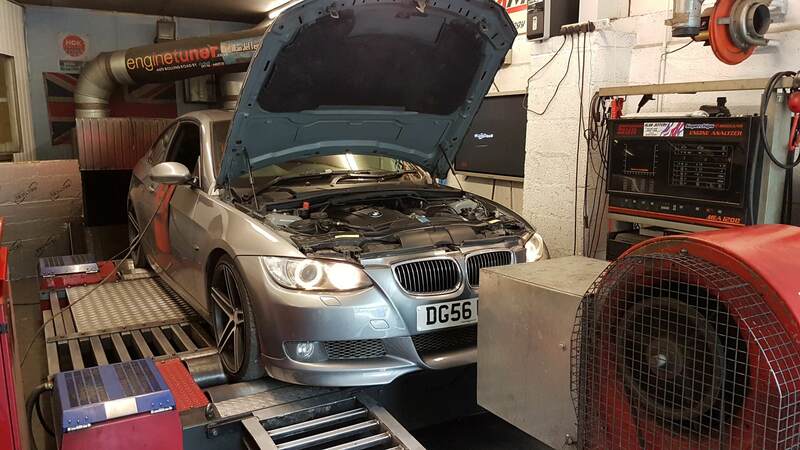 This is my E92 335i on dyno a year ago. Pump fuel (Shell V-Power 99+) and BQTune. Hybrid Turbo S2 from PerunTurbo, 4BAR TMap, Chargepipe, HKS BOV, Forge 7'' FMIC, Sport Alu Radiator, Ebay oil rad 3x bigger than stock, 3'' catless exhaust with MG Motorsport muffler, RM Motors downpipes, DCI from BMS, Air scoops, MMP in and out 2'' pipes, 550i Clutch, NGK gapped, many more little things I forgot about. Bottom line is, this was stock fuel system and now I know that car had misaligned camshaft as one cam skipped one chain giving non-ideal ignition at high RPM. Anybody have any e30 map dynographs? Is your clutch holding up ? Yes, there are pics of it in 550i clutch thread on this forum. I did 39k miles on mine and it still holded strong. Only thing, my pressure plate maxed out so the clutch was starting to grab up top the pedal. As I'm doing engine rebuilt before pushing for 600hp, I'm putting brand new 550i clutch. Mods:, MHD v8 Stage 1+ 93 octane, super dirty DCI (not cleaned 4+ yrs), downpipes. Car is a 08 e92 335i, has 165k km. Also have a 1-1.5 psi boost leak nbd, can't really find it + too lazy. 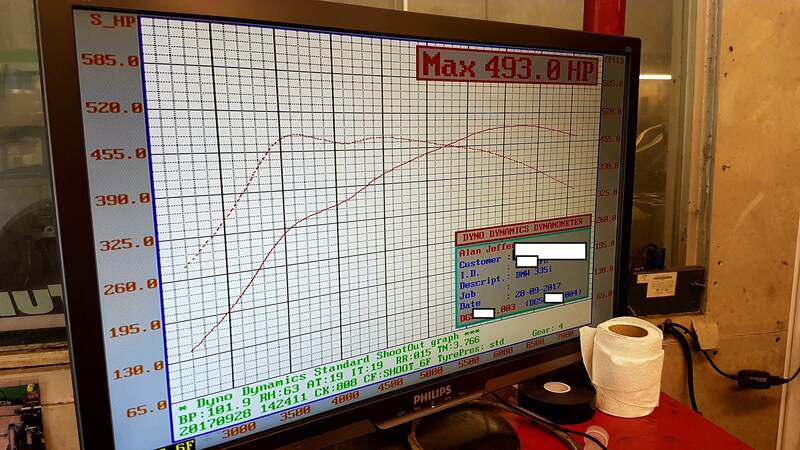 Got around 361WHP, max boost of 15.5 psi, im surprised my hp was this high actually, esp with my boost leak. When i smooth it out to 2 i get 350whp. Deciding if i want to go stage 2+ or not... decisions.... Wonder if stage 1+ accounts for the downpipes as it wasn't a requirement for that map.